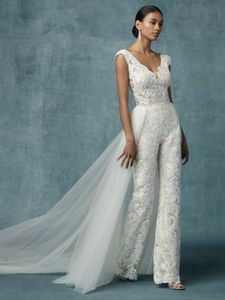 Description: This chic bridal jumpsuit features allover lace motifs atop tulle. Cap-sleeves complete the V-neckline and scoop back of the sheer bodice. Boy shorts made with shapewear give added comfort. Finished with zipper closure. Tulle overskirt with beaded belt sold separately.